Document Tray™—Have all your info with you when you need it; this hard slide out writing surface holds print-outs of your computer calendar, contacts, tasks or emails. Task Pad™—The Outlink® legal pad is perforated at the bottom to allow you to take away notes and reminders. Don’t let important tasks, meeting times, or appointment dates get lost in your notes! Write them in the Task Pad™ format at the bottom of each page, and tear off the section to keep as a reminder. 50 sheets, legal pad, perforated pages. 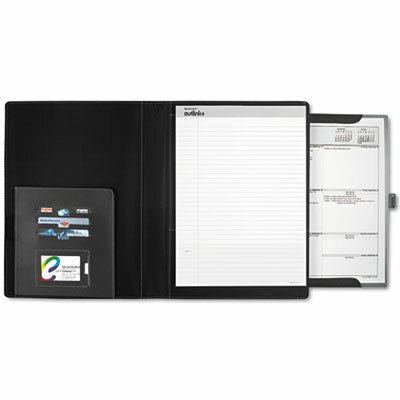 The Outlink® Solution: Document Tray™—Have all your info with you when you need it; this hard slide out writing surface holds print-outs of your computer calendar, contacts, tasks or emails. Task Pad™—The Outlink® legal pad is perforated at the bottom to allow you to take away notes and reminders. Don’t let important tasks, meeting times, or appointment dates get lost in your notes! 50 sheets, legal pad, perforated pages included.